Key FeaturesA step by step guide in designing your own automation testing framework with Selenium WebDriver DesignPerform Data driven automation testing of browser and mobile application in Selenium with TestNG and Java.Learn to design and use third party tools for results processing and reporting in the Selenium Framework.Book DescriptionSelenium WebDriver is an open source web UI automation tool implemented through a browser-specific browser driver, which sends commands to a browser and retrieves results.This book will provide a step by step guide in designing your own automation testing framework for data driven testing in Selenium WebDriver with TestNG and Java.The book will start off by setting up the framework for Selenium WebDriver and Appium MobileDriver for the web. We'll further understand mobile testing on different platforms leveraging the selenium driver integration for dual driver testing. We will also set up the Page Object Model (POM) for testing framework using Selenium. This will help us to create non-brittle test code and reduce or eliminate duplicate test code thereby improving the readability and creating interactive documentation. 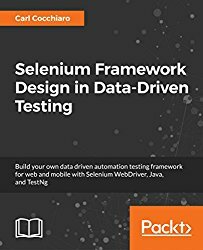 We will also learn to set up TestNG for data driven testing as Selenium Webdriver is more an automated testing framework than a ready-to-use tool. Towards the end, we'll get our hands dirty with Selenium grid architecture which allows us to test on different browsers, versions, and platforms.Finally, we'll explore a number of third party tools and plugin which can be added to our Selenium Framework.By the end of the book, you will be able to design your own automation testing framework and perform data driven testing with Selenium.What you will learnDesign the Selenium Driver Class for local, remote, and third party grid supportRepresent Page Object Classes using the Selenium Page Object ModelPlan Data-Driven Test Classes using the TestNG frameworkEncapsulate Data using the JSON ProtocolBuild a Selenium Grid for RemoteWebDriver TestingMap Utility Classes for use in Synchronization, File I/O, Reporting and Test Listener ClassesSample framework code for practical useAbout the AuthorCarl Cocchiaro is a Software QA Professional with expertise in design and implementation of automated testing frameworks and practices for both UI and API-based platforms. 30 years of experience in the Software Test Automation Field, primarily as a Consultant building Test Automation Frameworks for corporations such as IBM, Monster, EMC, DTCC, Intuit, and Dell TechnologiesTBD.